Still, a Basilard in the style of the mid-XIvth century. Several pieces served as inspirations for this custom project, that alowed me to try my hand once again at making it "the old way", ie through a minute, accurate and rational sequence of crucial steps in the forging geared towards a economy of work and material. 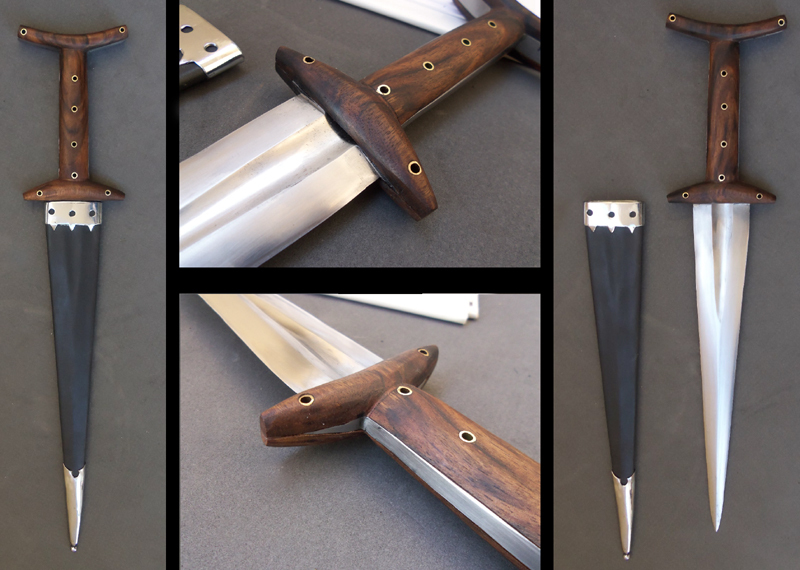 The blade is 1075 steel, that has been given a differential HT ttrough temperature control, tempered to blue. As for the previous Baselard I made, the H-shaped handle has been forge-shaped, and the very gestures, strikes and tools I used directly ended in both the profile and section you can see on originals (ie with the 'edges' of the grip being 'thicker' than its center - like a U with a square bottom). The top bar, for instance, was first made as a hole punched through the metal, then drawn, then flattened ; the fuller has been hammered in, up to deep into the grip, which istelf has been given the U-shape pentionned above. All was then stone-finished (and sharpened). If you'd like, I could provide you with a step-by-step summary of the process (those who know me on a famous so-called "social network" have probably seen it already). Scales are boxwood, rivets are brass. Dont mind the tiny black dots on the blade : it's leather from the inside of the sheath. As usual, the leather has been dyed using iron oxyde, and hand-stitched. Scabbard fittings are mild steel. Thanks to the customer for allowing me to work on this project - the constant exchange we had is among the things I value the best in this trade (or the way I run it). HELL YES. I like that a lot. 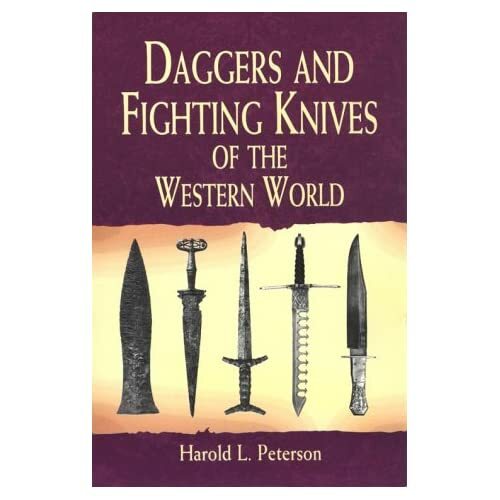 I have more daggers than swords, and IMO the Baselards and Holbeins rule the roost. Exquisite work, Mr. Cognot. Thanks for posting the pictures. I never thought much of baselards before, but this one I like. Like Colt, I never gave baselards much thought, but this beauty has really attracted my attention! A wonderful piece of work, thanks for the photos and commentary. Sometimes Baselards can have a 'I' form hilt which is too thin, too exaggerated, or perhaps even overly pedestrian. But when done nicely with some detailed touches as shown by Mr. Cognot, the Baselard form can really shine. Leo Todeschini also has made some real beauties, as has Tinker Pearce. WOW--not really a fan of basilards (baselard? ), but that is gorgeous. Love that fuller and how the in-built cross tapers out, allowing the scales to touch. Wonderful detail. Whistle-worthy sheath too. That is very attractive, both dagger and sheath. He's new to me, wow! Very nicely proportioned, nice triangular blade and fuller and the wood grip looks very attractive. this baselard in particular looks quite good as well and looks likeits a nice little sidearm to have with you.. Thanks all, you're too kind. 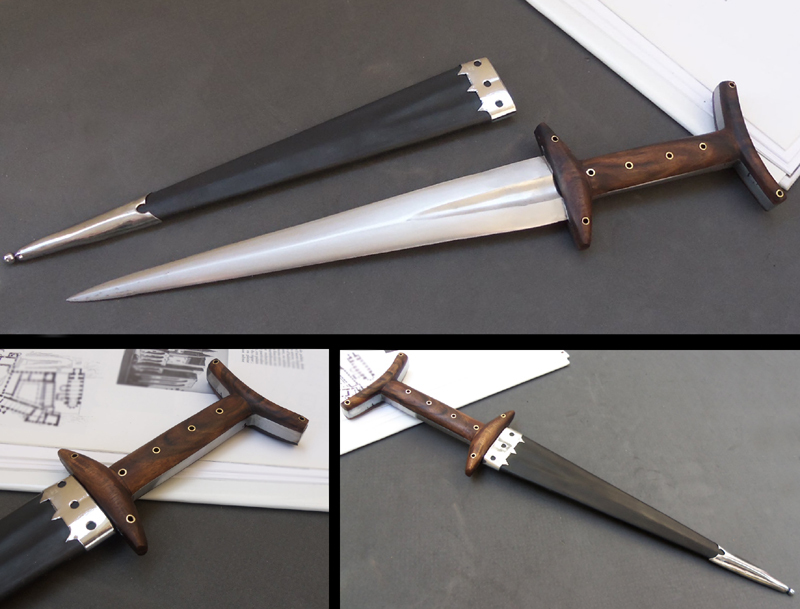 Having seen many of Fabrice's pieces 'in the flesh' I have to say that if you are in the market for a high end and truly authentically made knife or dagger (or warhammer or pollaxe! ), that actually looks like a real piece from a museum, then you'd be stupid not to get a quote from Fabrice. Every time I see the sharp pollaxe he made (and is now owned by a Hungarian HEMA practitioner) I want to cry because I don't own it. Like Fabrice, I have seen and handled quite a lot of museum examples of these types of weapons, and the thing that bugs me about many modern manufacturers is that they may make a fantastic product, but they end up looking like they were made in the 21st century somehow.. Fabrice's pieces actually have the look and feel of the originals, even down to non-intrusive minor forging flaws. Fabrice doesn't take short cuts, he tries to make every end product as close to original types as possible. Fantastic dagger Fabrice! Your attention to detail is excellent and the results have a very authentic feel. Your efforts continue to inspire- keep up the good work! Thanks Matt & Tinker. I'm blushing now. Starting with a modern 6mm by 40 mm high-carbon steel bar, the rough forging process begins (1). The edges are drawn, and the handle is shaped. The hammer blows give the handle this specific section, thicker at the edges and thinner in the middle. The fuller is then forged in, slightly widening the blade at its base, and a hole is hot-punched at the top of the handle section. It's then drawn in the shape of a ring, which is then flattened to give the characteristic figure of these daggers (3 and 4). The 'quillons' (lacking a better word) are then drawn from the remaining stock, and the edges are drawn again, flattened and straightened. Then it's off to grinding, and filing, and sanding the blade, prior to heat-treating. Quite a critical moment, in which all the previous efforts can be ruined, as you all know. 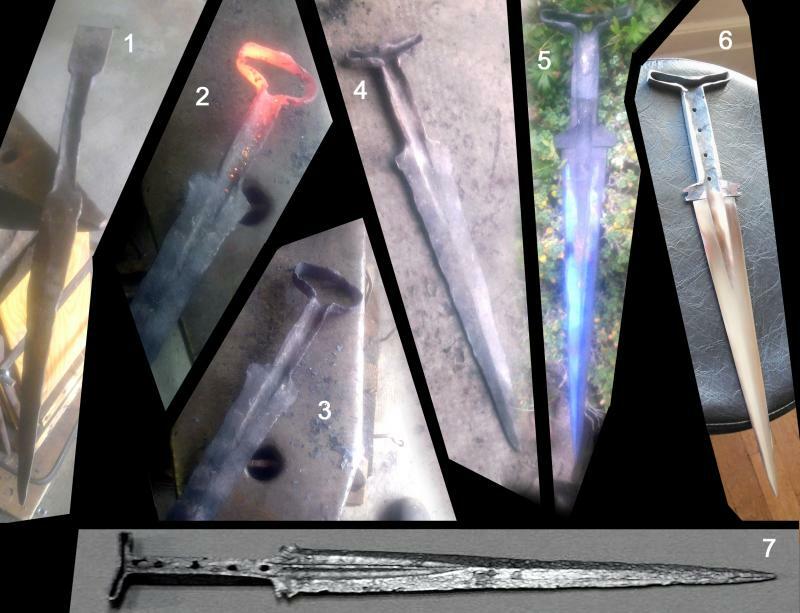 Here on (5) you can see the blade after tempering to blue (you can also admire the ocal flora near the forge). I generally give my daggers and fighting pieces a spring temper for toughness (even though I hope they'll never be used for *actual* fighting, for it's a nasty thing..). The blade is then sanded a bit more, and sharpened. I generally do it by hand, using files, sand paper and stones. The hilt goes through the same treatment. Here on (6) the holes were drilled, though, not punched : as you can see, the tang was a bit too thick in the middle after the forging, that's why I had to drill the rivet holes instead of punching them (thus making what Mr Easton wrote above a lie : I do take shortcuts sometimes - but I can explain...). But you can clearly see the U-shaped section of the handle. (7) shows a period, XIvth century basilard kept in Verona, shown on the reverse side (as compared to (6) ) : you can see the 'flat' side of the handle. Notice how minute details (hopefully) match closely between these two pieces (apart from the double fuller on the Verona example) : the hilt, thickening towards the top ; the 'quillon' holes, ad the overall 'flow' of the metal, and again the typical hilt construction. Lovely piece in every aspect! Another beautiful piece Fabrice. I can't much more than has been said already, but from my point of view I love the way you approach your projects and the end result is always well worth seeing. Thanks Tod ! I missed your reply, but coming from you this is really an honour and a pleasure.